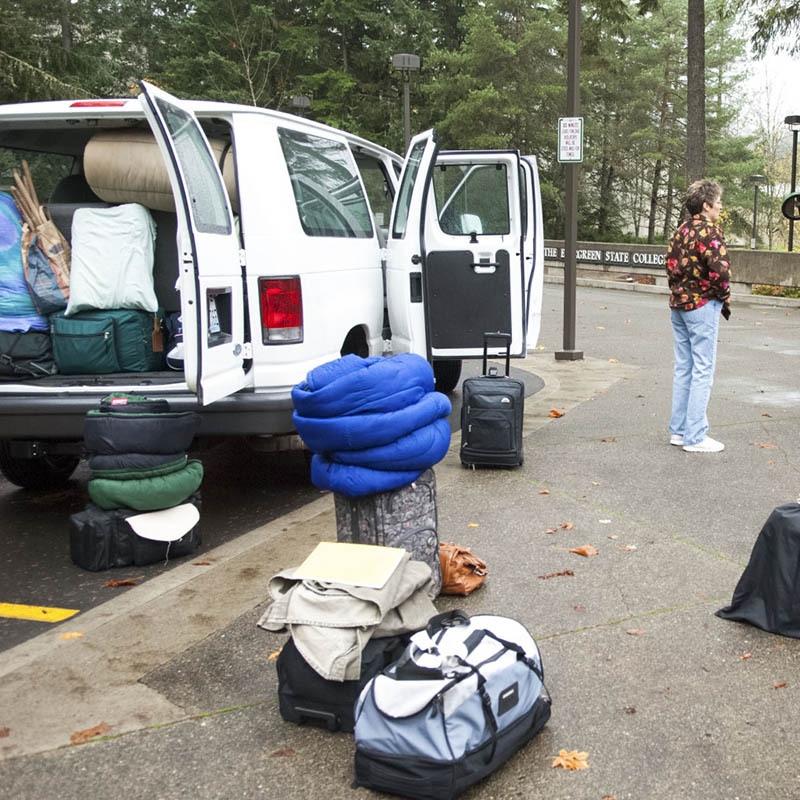 Most students, faculty, and staff are eligible for an Evergreen vehicle use permit. You must have a permit before you can use any vehicle from the fleet. Clean driving record, with none of the following within the past (2) years: any suspension/revocation of license for reckless driving, hit and run, leaving an accident scene, failure to appear, DUI or other vehicle-related felony; or for multiple traffic offenses (2 moving violations/infractions in 12 months/3 moving violations/ infractions in 24 months) resulting in a Conditional Status driving record or subsequent suspension/revocation of license. You are not required to have your own personal liability insurance. However, because of the limitations of the state's self-insurance plan, you may want to check with your insurance to see if you are covered while driving a Motor Pool vehicle. More about insurance coverage. Restrict passengers to employees, students of the college, or other people on official college business. Make sure that everyone in the vehicle uses a seat belt while the vehicle is moving. Make sure that no one smokes or consumes alcohol in the vehicle. Lock the vehicle when not in use. Pay any traffic or parking fine resulting from driver negligence. Check oil and water levels regularly when on overnight trips. Report all accidents and damage to the vehicle to the Motor Pool office immediately. Complete all required accident reports and turn them in to the Motor Pool office. Return vehicles to the appropriate location on time and in a clean and presentable condition. Notify the motor pool office if the vehicle cannot be returned on time. Before you can use a college vehicle, you need to get a Use Permit. You also need to renew this permit every two years. If you are involved in a crash with a college vehicle and are found at fault, we may revoke your use permit. Students need advanced faculty/supervisor permission to obtain a use permit. Have your faculty, supervisor, or Student Activities advisor send us an email ahead of time. Bring the completed release forms to the Motor Pool office, along with your valid driver's license and Evergreen ID. When applying for a first time permit or renewing an expired permit, you'll need to sign forms authorizing us to see your driver's history report and acknowledging your responsibilities driving an Evergreen vehicle.